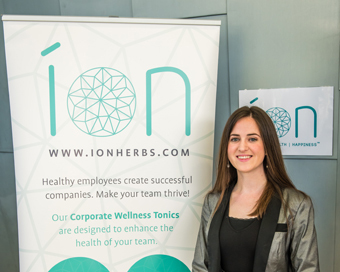 For companies who want to boost employee health and moral, ÍON delivers to their office premium herbal tonics each month that change with the seasons. The organic herbs are functional in that they reduce stress, boost energy and immune defenses. I was awarded €50,000 competitive start funding from Enterprise Ireland and I participated in their New Frontiers Phase II programme. Edgier companies willing to try something novel to get wellness results for their team. Current subscribers to our herbal wellness programme include Aircon Mech, Bluefin Payment Systems and EirGen Pharma. I love Pukka Herbs for the way they source their herbs and they really understand the value and potency of herbs. They have a mission of educating people about herbs, so like me, what they are about is more than a product. For me, I’m on a mission of helping to improve people’s health with herbs. With my doctorate in science and my herbal medicine studies underway, I’m ready to face the challenges of this mission! Securing my first two companies was a very exciting feeling. But even more rewarding was the data that was delivered back to me. 90% of participants prefer ÍON programme over other wellness options such as counselling, massages, gym membership. This is very important to know that I am offering something of value to my customers. Also, it was exciting to discover that by the third week 87% of participants found definite improvements to their energy levels and/or health. I’ve been trying to find a reputable and high quality manufacturer to take over manufacturing of herbal tonics, but this has been a challenge. The process is quite niche and differs from juice production so manufacturers are reluctant to take it on. I’m taking my time with social media. I recall the words of Mark Little that social media is much broader than Facebook or Twitter but extends to real life gatherings about your product or area of expertise. I prefer giving presentations at meetings and events where I can really hear from my customers how my product is benefiting them and in what way I can help them further. Facebook is definitely a useful tool but I’m not giving it much focus at present. Tony Robbins has lots of awesome advice on business models so I would recommend you check him out. I think the best business model has a number of revenue streams. In my business I sell online, to corporate customers and to retail, namely Lloyds Pharmacy. This means that ÍON herbal tonics are available by 3 different routes. Should one route diminish it means that 2/3 of my business still exists. I would implement a new design for my packaging, hire lots of good people, especially sales people and start exporting to the USA with offices in San Francisco & New York. My best traits would be tenacity – I don’t give up and I have an ability to bounce back! I have courage and this means I take risks. I have a good brain for solving problems. The traits I’m working on improving are time management, as I can lose myself in something I’m working on and I don’t stick to the schedule I’ve given myself. Punctuality would tie-in with that one. I have high expectations of myself which means I tend to expect the same from others. So I can sometimes be a little demanding from people if I am honest. Tony Robbins. Need I say more?! Somebody who has the same holistic health philosophy as I do and who is crazy about sales and somebody who has loads of business experience. I guess Jay Abraham would be great! Hold a vision of your larger-than-life goals, but at the same time learn to be present with the small victories and experiences along the way towards your big goals. The journey and who you become to reach those goals is what matters more than the goals themselves. One secret to success is to keep doing the things that scare you and you’ll be amazed at what results come from just that. For somebody thinking of pursuing a business idea I would recommend you start small and do one thing each day that progresses your business idea. Success follows the brave so be strong and believe in your idea! It really is worth it when you are following your passion and living your full potential.